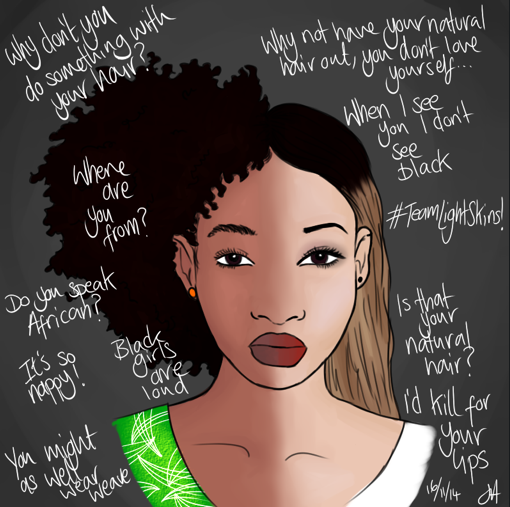 5 Things You Should Never Say To A Black Girl! So today's post is a tad humorous, however there is an element of the truth stuck in there for good measure. A laced joke, if you will? Some of the statements below have been said to me directly, indirectly, or my friends/family, or about Black people on social media. Is that your natural hair? Why don't you do something with your hair? When I see you don't look Black (or Ghanaian, Nigerian, Jamaican etc.)? Why don't you wear weave? Why are y'all (black people) so loud, ghetto, ratchet? Sometimes I think when people say these statements, they don't mean to cause offence, and other times I think they just don't care. Either way, I think it is always best to err on the side of caution, when about to make a comment that could be deemed racially insensitive.